Welcome Granular 1.0 aka Esto Vox! Lead developer Anurag Bhandari has announced the release of Granular Linux 1.0, a PCLinuxOS-based desktop distribution which brings with it solid stability, out-of-the-box usefulness, great multimedia experience, support for running Windows software, and much more in a Live CD. The current release embraces Linux kernel 2.6.26.8, KDE 3.5.10, Firefox 3.0.4, Thunderbird 2.0.0.14, KOffice 1.6.3, Compiz Fusion 0.7.6, GIMP 2.6.3 and Wine 1.0.1. What's more, Granular has its own new repository. Support for FAT16 and FAT32 has been merged with Linux Kernel, since many years. It's a good thing. But I wonder when the same will happen with NTFS, the widely popular filesystem for windows XP, Vista, and the upcoming Windows 7. As of now full read/write support in Linux has been a workaround with ntfsmount, ntfs-3g, both of which require fuse. And both of these don't come configured for lay-users. Of course, many distributions such as Mint and Mepis have ntfs-3g as a default install, PCLinuxOS repo has the packages. But it never sounds solid. And the looks the configuration fragmented where you have to run fuse services and mount with ntfs-3g or ntfsmount options. Even the mounting sometimes becomes trickly involving superuser permissions. Is there anyone working on "merging full ntfs support into linux kernel"? Will full ntfs support always be a dream? Will we ever have full NTFS support? NTFS has been around for many many years. I am sure Microsoft will never be happy or want to release documentations of NTFS. That means Linux folks have reverse-engineer the ntfs support. But it's high time linux had full ntfs support merged in the kernel. After all, we are living in a world dominated by windows where we have to deal with ntfs formatted media every now and then. Please post any info you have regarding "merging ntfs support into linux kernel". Desktop Linux - If it ain't broke don't fix it! Hobbyist attitude in Linux world is not always good. There is no hue and cry if a Microsoft release is delayed or a Mac OS is postponed for sometime. But it seems Linux is moving just too fast, and everyone including developers and users are running to catch up with the pace. And it creates a lot of problems - developers are busy in fitting the latest kernel and other packages to their distro, and users are awake looking at the repo to install the latest packages and newer kernels, at times even if the same is not required. Thanks God, the two distros Mepis and PCLinuxOS (both are my favorites) are not after this rat-race. They would stick to the recent stable apps and well tested kernel. Of course, this approach results in slow release cycles. But I am happy at a slower and well-tested releases, than a hurried latest and greatest release. However, sometimes I also get carried away by the newer releases. Here is an example. I have been using Linux for a decade and using PCLinuxOS since it's 0.92 release. I had installed PCLinuxOS 0.92 sometime in 2005 worked on it for quite a long period, and installed the much anticipated pclos 2007. But I had to distro-hop, when I sold off that desktop and brought home a low-cost notebook. Hopped a full circle across the much hyped distros but again came back to pclos - the venerable PCLinuxOS 2008 MiniME. From the day MiniME 2008 was released, there has been a lot of development in Linux World, but PCLinuxOS development has been somewhat slowed down, only for good. But I was also too anxious to grab a PCLinuxOS 2009 iso. When its tr5 was released, I could not resist to pull in the packages such as the newer kernel 2.6.26.8, kde 3.5.10 and some updated apps from the testing repo. Of course, I had doubts whether it will break my system, but fortunately installation went fine and the system is working as before. I compared the performance of both the kernels - 2.6.22.15 and 2.6.26.8 on my notebook, but could not find any difference. However, kde 3.5.10 seemed more polished than its previous version, but no major difference. Hence, as a long time Linux Desktop user I would suggest others not to create chaos if a certain distro release is delayed and not to always run after the latest releases. In short, if a particular release works for you, work on it don't work at it. Don't run after frequent updates. What Keeps Linux from Mass and Corporate Deployment? I was going through this Interview with Warren Woodford , and that old "Linux Desktop of the Year" thing came across again. That interview talked a lot about Mepis, Ubuntu, Corporate Use of Linux and the Future of Client-side Linux (Linux Desktop) as well as about IPv6 and DNSSEC. Scott: What about the year of the Linux desktop? Warren: It's never going to happen. Sorry. Warren: There's a chicken and egg problem with getting it on the desktops, where no matter how much Mark Shuttleworth does, Michael Dell is not going to tell Bill Gates where to go. No one is going to forget that Microsoft's the big game in town, no matter how much Microsoft stumbles. Mark Shuttleworth can spend his entire billion dollars on trying to make Ubuntu good enough to shoot down Microsoft on the desktop and that won't change. It goes back to what I was saying earlier about the fragmentation in the Linux market. You don't have one set of products against which you can build commercial software, or do commercial deployment, or even long term enterprise deployment. It's doable with Ubuntu, but it's not a no brainer, although Novell and Red Hat are trying to address that part. Right now, I don't know of a single major corporation that would go with Linux on the desktop for one reason–no Visio. Until OpenOffice does a Visio clone, you can forget it. I like Warren for his no-nonsense clear comments and his technical expertise. In fact, he is a true champion of Linux Desktop (like Tex) who puts users first, and ensures extreme quality of every release. He can't be wrong when he says the fragmentation in the Linux market is the major hindrance in the desktop deployment of linux. Fragmentation of Linux market does more bad than good to the popularity and deployment of Linux. The multiplicity of distros often do more harm by warding off many linux enthusiasts. In my 10 years of experience with distro-hopping I have tried more than 100 of distributions, but liked only PCLinuxOS, Mepis and Mint to be really usable for desktops. Apart from it, multiplicity of distros, rapid release cycle of base packages, kernel and libraries pose many difficulties for application software developers. Only a few like OpenOffice and Firefox has done a great job in bundling software that often works across most of the linux distributions. Does anybody know what happened to the Linux Standard Base (LSB)? 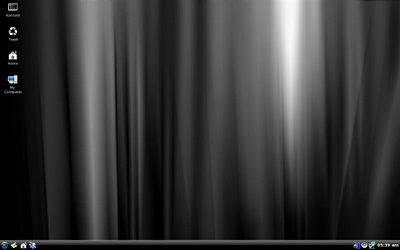 Here is my radically simple pclinuxos 2008 desktop. Today most of the linux distros come with flash plugin preinstalled. 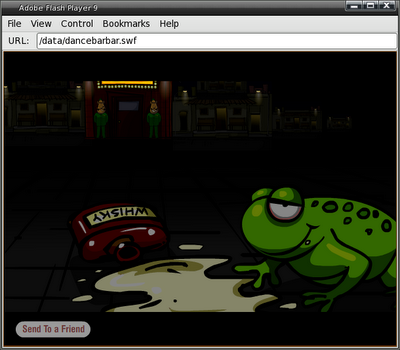 Hence you have no problem in playing flash animations in your web browser. But the difficulty arises while playing individual (downloaded swf games, files, presentations) swf files as most of the distros don't have a standalone flashplayer. 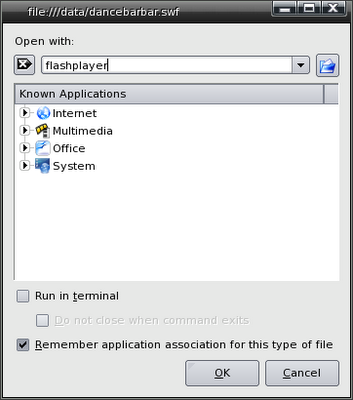 Here is the trick to install standalone flashplayer on PCLinuxOS 2008 MiniME. This trick will work across all the distros but you have to make sure that you are installing the same version of standalone flashplayer as your flashplugin. For example, I have flashplayer plugin 9 installed on my pclos 2008 minime that's why I installed standalone swf player 9 from adobe flashplayer website. Here are the steps. Install flashplayer plugin from your distro's repo or from adobe flashplayer website download section. Download standalone flashplayer from adobe flashplayer website download section (you can download standalone flashplayer at http://www.adobe.com/support/flashplayer/downloads.html Please skip down the page to Linux Debugger and Standalone Players for Flash Developers on that page). Extract the files and copy the flashplayer binary file to /usr/bin. Rightclick on a *.swf file, select openwith option. Type flashplayer in the textbox below openwith as mentioned in the screenshot below, and check the remember option. You are done! Henceforth, you can open and play any swf file just by double clicking on it.